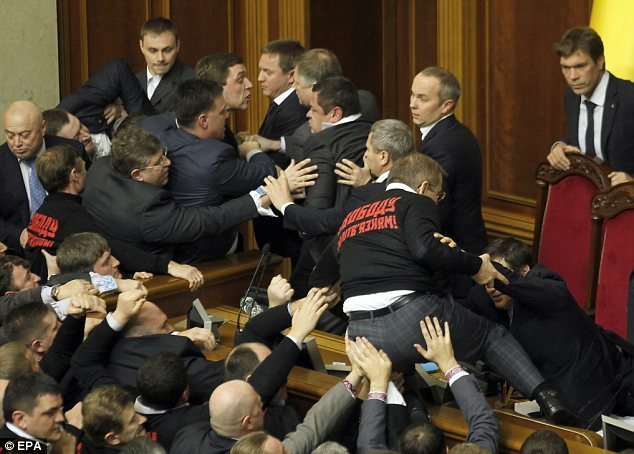 Ukrainian parliament’s new session got off to a dramatic start with MPs brawling on the floor of the chamber while a Femen protest against corruption was staged outside. Members of feminist group Femen, whose motto is “We came, we undressed, we conquered”, stripped naked down to just black pants and knee-high black socks in temperatures of minus 3C. Their stunt was an attempt to draw attention to the plight of opposition leader and ex-premier Yulia Tymoshenko who was jailed for crimes not recognized in the West as punishable by prison. Before being hauled away by police, the Femen protesters claimed parliament, which met for the first time since the “flawed” October elections in the country, was a “stable” for the “horses of oligarchs”. Inside parliament, the opposition nationalist Svoboda group chased and manhandled two MPs, a father and son, in a bid to prevent them taking the oath. They were physically ejected from the chamber by opposition deputies who accused them of defecting to the ruling coalition. The procedural wrangling at the opening of the new parliament threatened to push back a key vote on whether Mykola Azarov will be endorsed for a new term as prime minister. The vote will be the first test of the support for President Viktor Yanukovich, who re-nominated Mykola Azarov. MPs from Yulia Tymoshenko’s party wore black jerseys with her portrait on the front and the phrase “Freedom to Political Prisoners” on the back. Yulia Tymoshenko remains in prison after being sentenced to seven years in prison in 2011 for alleged abuse of office over a gas deal with Russia. Viktor Yanukovich’s pro-business Party of the Regions and their allies enjoyed a strong majority in the last parliament, which allowed them to push through changes to the electoral law and a law on use of the Russian language that sparked street protests. Despite losing seats in the October elections, the results were seen as a consolidation of President Viktor Yanukovych’s power as his party still remained the biggest in parliament. Most analysts said they believed horse-trading would ensure enough support from independents and others to secure the required 226 or more seats. But the new opposition line-up, whose leaders have ruled out any coalition with the Regions, quickly showed their teeth. Deputies from the three main opposition parties surrounded the speaker’s rostrum, effectively blocking activation of the electronic system which would allow deputies to vote on Mykola Azarov’s nomination and the appointment of parliamentary officials. After a prolonged stand-off, both sides went home agreeing to resume business on Thursday, according to the Regions Party. Separately, the government put off a meeting scheduled for Thursday morning.